2019 will be a big year for the US Navy and its pursuit of a Future Frigate (FFG[X]) to provide the force with an up-armed, interoperable surface combatant to complement the existing surface fleet and allied naval capabilities, with industrial opportunities for allies like Australia. Growing concerns about the combat capability and survivability of the Freedom and Independence Class Littoral Combat Ships (LCS) has prompted the US Navy to pursue a new, multi-mission, highly capable surface combatant capable of integrating with US Navy and allied surface battlegroups. As part of the request for information (RFI), the US Navy expects the FFG(X) will provide a capable, survivable and cost-effective platform, with an expected unit price of US$950 million ($1.32 billion) and capable of "aggregating into strike groups and Large Surface Combatant led surface action groups but also possess the ability to robustly defend itself during conduct of independent operations while connected and contributing to the fleet tactical grid". "The Navy is interested in the FFG(X) to provide Combatant and Fleet Commanders a uniquely suitable asset to achieve select sea control objectives and perform maritime security operations while facilitating access in all domains in support of strike group and aggregated fleet operations," the RFI explains. Accommodation for an MQ-8C Firescout unmanned aerial system. 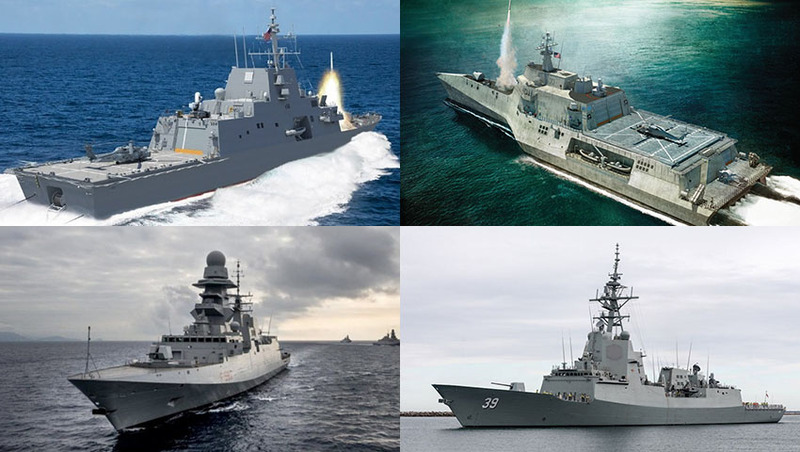 In order to avoid price, research and development cost increases, the US Navy has sought tenders from a group of five established shipbuilders delivering evolved variants of proven frigate designs currently in operation with US or allied forces around the world. Interoperability with allies including Australia, Canada and the UK is a core focus for delivering the FFG(X) program with a focus on integrating either a 'common combat system' or an interoperable combat system. Austal USA - Independence Class Frigate: A modified variant of the Independence Class LCS, incorporating additional anti-ship missile systems, a shortened flight deck and optional Mk 41 vertical launch systems (VLS) to exceed the minimum required by the US Navy's request. Lockheed Martin - Freedom Class Frigate: Based on the in-service Freedom Class LCS, the Freedom Class variant incorporates a common architecture to the Royal Saudi Navy's multi-mission surface combatant, which includes eight Mk 41 VLS, advanced air search radars and enhanced combat capabilities. Huntington Ingalls Industries - Patrol Frigate (PF4501 and PF4921): Two upgraded variants based on the National Security Cutter (NSC) design currently in operation with the US Coast Guard. The evolved variant includes a 12-cell Mk 56 VLS, two quad launch systems and incorporation of the SPY-1F air-defence radar. The PF4921 variant has been displayed incorporating the Australian designed and manufactured CEAFAR radar system. Fincantieri Marine Group - FREMM Multipurpose Frigate: Based on the joint Italian/French multipurpose frigate program, it incorporates US-specific capabilities including the Mk 41 VLS and Mk 110 gun system with Aegis derivative COMBATSS-21 system. General Dynamics/Navantia - F-100 Frigate: The basis for the Royal Australian Navy's Hobart Class Air Warfare Destroyers, the F-100 design delivers a common design currently in service with Spain and Australia and incorporates the full SPY-1D Aegis combat system, combined with a five-inch Mk 45 Mod 4 naval gun and 48-cell VLS. The focus on a proven platform reveals the US Navy's desire to avoid "sticker shock" by getting the design correct in the early-stages of the program and also provides opportunities for Australian industry. Australian expertise developed throughout the design, build and integration phase of Australia's Hobart Class destroyers, combined with technical expertise in phased-array radar systems in the form of CEA Technologies and the CEAFAR radar systems that will serve as the basis of the Royal Australian Navy's future Hunter Class frigates' radar system, build on the US Navy's focus on delivering proven technologies and systems to minimise unit introduction, cost overruns and capability delivery. CEA’s phased array technologies provide modular and scalable phased array products suitable for use in the maritime and land environments. The CEAFAR active phased array radar provides a multi function digital beam forming radar capability able to perform 3D volume search, surface search, fire control support, target classification in demanding, cluttered and jamming environments. Australia recently used combat system evaluation and missile testing operations for the HMAS Hobart with the US Navy to demonstrate the capability of the evolved F-100 Frigate platform, key Australian-specific components and capabilities and the capability of the vessel to operate seamlessly as part of a US Navy battlegroup through the co-operative engagement capability. The US Navy expects to purchase the first FFG(X) in 2020 with the first vessel expected to be in service from 2024, and the request for proposal (RFP) to be made in 2019 following the final definition of specifications for the FFG(X) program.